11 weapons stolen from IDF soldier's homes, bases just last month. Intelligence information recently received by the Military Police and the Israel Police indicates that criminal organizations and terrorists are trying to steal weapons from the IDF. The stolen weapons include mainly grenades, explosives and bullets. The increase in attempts to break into bases have forced the IDF to increase security to prevent the theft of weapons and ammunition. 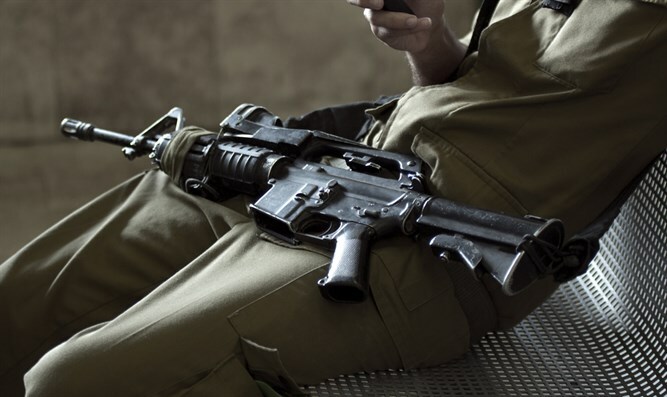 Arutz Sheva has learned that 11 weapons were stolen in the month of April alone, three from the homes of IDF soldiers and eight from IDF bases. 21 weapons have been stolen since the beginning of 2018. In response, the IDF has taken steps to the quantity of weapons in the units in addition to the additional security measures to prevent weapons theft. Maj. Gen. Gil Mamon appealed to the IDF commanders to ensure that the weapons in their units were properly secured, and, if necessary, to carry out searches and inspections of soldiers' equipment prior to their departure from their units. The Commander of the Military Police also demanded that soldiers who go homee with weapons be reminded of the need to dismantle and hide the weapons in a secure manner in accordance with orders from the General Staff. Soldiers who testify that they cannot properly secure their weapons will be instructed to carry the weapons with them at all time, or alternatively, to leave their weapons with their unit quartermaster before leaving base. The IDF Spokesperson stated: "The IDF is working vigorously on a number of levels to eliminate thefts of weapons. Recently we have witnessed the phenomenon of theft of military weapons. Therefore, an officer of the Military Police Corps was deployed in order to sharpen the procedures and carry out preventive and control activities within the IDF bases and when they are off-base."